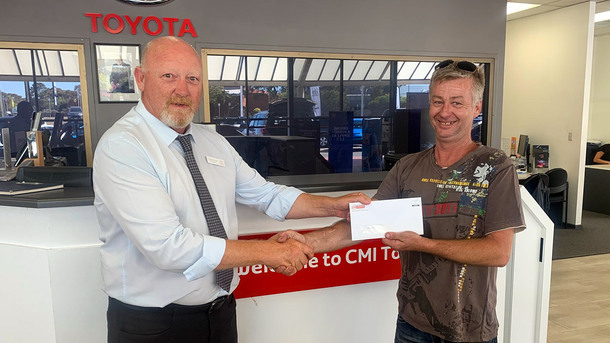 The CMI Toyota Christies Beach team recently had the pleasure of presenting Darren his cheque for $10,000 after being drawn as our $20,000 Cash Giveaway major prize winner. Darren purchased a 2014 Prado GXL from CMI Toyota Christies Beach during the four day $20,000 Cash Giveaway promotion in December and never expected to receive a call from our team to let him know he had won $10,000 cash! You can imagine his excitement when after receiving the news - you could not wipe the #cmile from his face! What a way to start 2019! Congratulations to Darren and all of our $2,500 Daily Cash Prize Draw winners - we wish you many happy and safe years behind the wheel of your new cars. Thank you for choosing CMI Toyota.